Yesterday morning I woke up in a Saturday Stitching mood and had visions of making the Sorbetto Top which I don’t seem to have gotten round to, despite having the fabric and notions ready to go. However, my Saturday Stitching plans were quickly de-railed when while getting dressed I discovered a wardrobe gap which required immediate rectification! 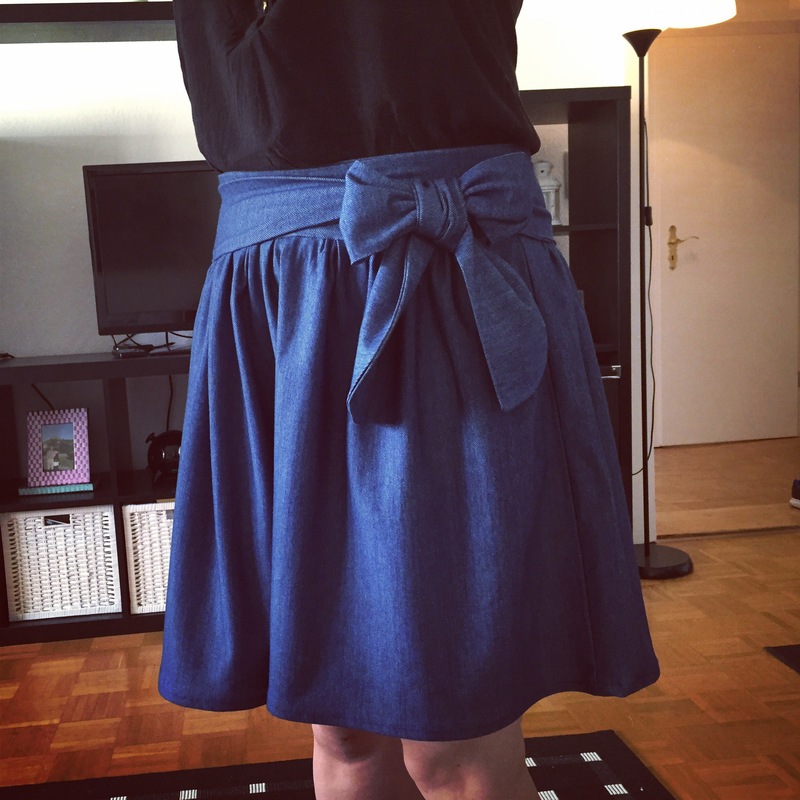 It has been exceptionally warm here in Frankfurt this week and I woke up convinced of the need for some kind of comfortable weekend pull on jersey skirt …. and this was the outcome! Whilst in the store I googled “easy jersey skirt pattern” and found this iCandy Hopscotch Skirt. Whilst stripes aren’t really my thing and I thought I’d leave the bow (little did I know that I would decide to add it back later) I really liked the shape so I thought I would go with it. I took a guess at my waist measurement and bought 90cm of fabric. Once I got home, I set about cutting. I was really nervous to cut in to the fabric as it was quite expensive and I knew I wouldn’t have any spare for mistakes! As much as I loved the shape of the hopscotch skirt, I found the tutorial instructions a bit confusing, so decided instead to take my own approach based on what I’d learnt from sewing a Clemence Skirt by Tilly and the Buttons. This skirt is basically a classic circle skirt constructed from two waistband pieces and two large gathered squares of material. I set about making the waistband by sewing two strips together right sides facing. I was so pleased that the lady in the fabric store had given me the top tip not to press, but to steam this fabric in short bursts. It really helped to stop the strip of fabric keep rolling back in on itself! As the jersey fabric had quite a lot of stretch, I chopped about 4 inches off the waistband length to encourage it to sit well. Once I had my waistband, I set about the side seams. As I don’t have an overlocker and didn’t want any raw edges on the inside of the garment, I went with French seams to keep everything nicely enclosed, which worked out really nicely. I then moved on to gather the top edge with two rows of gathering stitches. I’d never gathered jersey before, so I wasn’t sure how it would work out, but it was actually not that different from what I’d done before on Clemence! All that was left was for me to attach the gathered skirt to the waistband. I decided that I wanted the gathers to be enclosed on both the inside and the outside of the skirt, so I attached to the front waistband and then stitched in the ditch to attach the back of the waistband to the inside of the skirt. My stitching in the ditch has made marked progress since I started sewing and I love the fact that my skirt looks just as good on the inside as it does on the outside! Once everything was attached, it was time to tackle the hem. 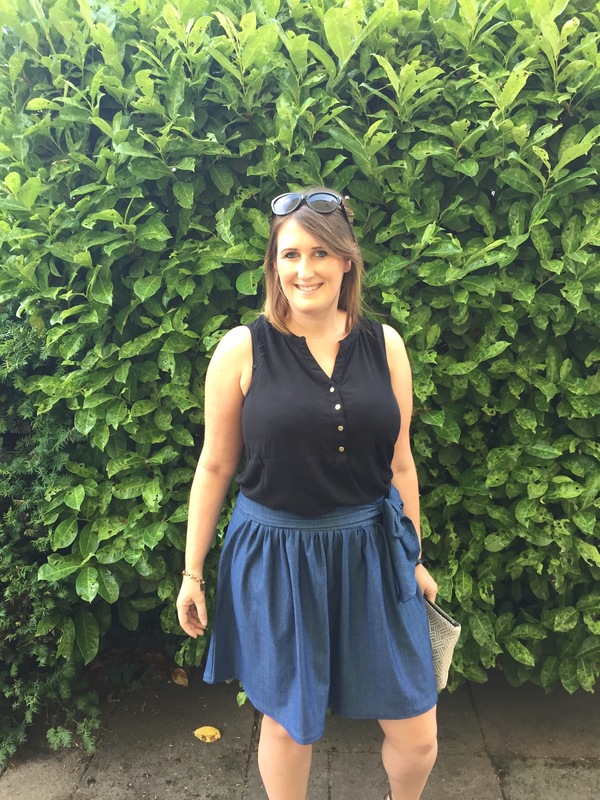 The skirt that I’d made was over the knee length – would have been great for work (if I could get away with Denim look stretch jersey at work) but wasn’t really the look I was going for for the weekend! So I took off a good 4 inches at the bottom and hemmed to about an inch above the knee. Circle skirts can be a bit *yawn* to hem (on and on and on it goes …) but then it was all finished up! I tried it on and suddenly had the feeling it was missing something. I decided I wanted some kind of an embellishment to make it a bit less plain. Initially I was going to go with patch pockets until I saw my remaining 4 inches of skirt length just sitting on the cutting table shouting “make that bow sash out of me”. I’m not really a bow person, so I wasn’t sure it was the right decision, but once it was finished I was really pleased! I wore my finished article out for cocktails that evening and I loved having something on that I enjoyed making so much! Here I am in the finished article! It felt like an achievement to have not followed any instructions, but to just have used the techniques I’d already learned! I also think this skirt will be a real wardrobe staple – light for summer weekends or with black tights, tanned boots and a jumper in the autumn! Denim is so versatile, I’m glad I didn’t go with the boring black jersey. Saying that, now I feel compelled to sew another one of these up in black after all … maybe with pockets next time?! Have you done any spontaneous sewing recently? I’d love to hear about it! That’s lovely! Doesn’t jersey feel nice? And it hangs and moves so fluidly. Thank you 🙂 it really does! Now I’m thinking up all kind of jersey skirts! Also got a pattern for some soft jersey joggers that I thought I might try … I can’t believe I was scared of jersey for so long and now it is my friend!! I’m thinking of sewing ByHandLondon’s Moneta Dress for my first attempt at jersey … quite excited to see how it turns out!